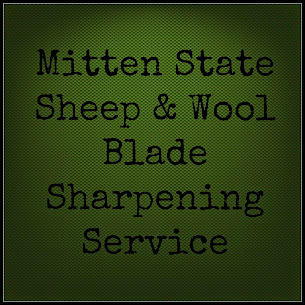 The last couple of weeks I have been cleaning out a corner in the basement for a make-shift studio, and collecting up items I would need for dyeing wool. 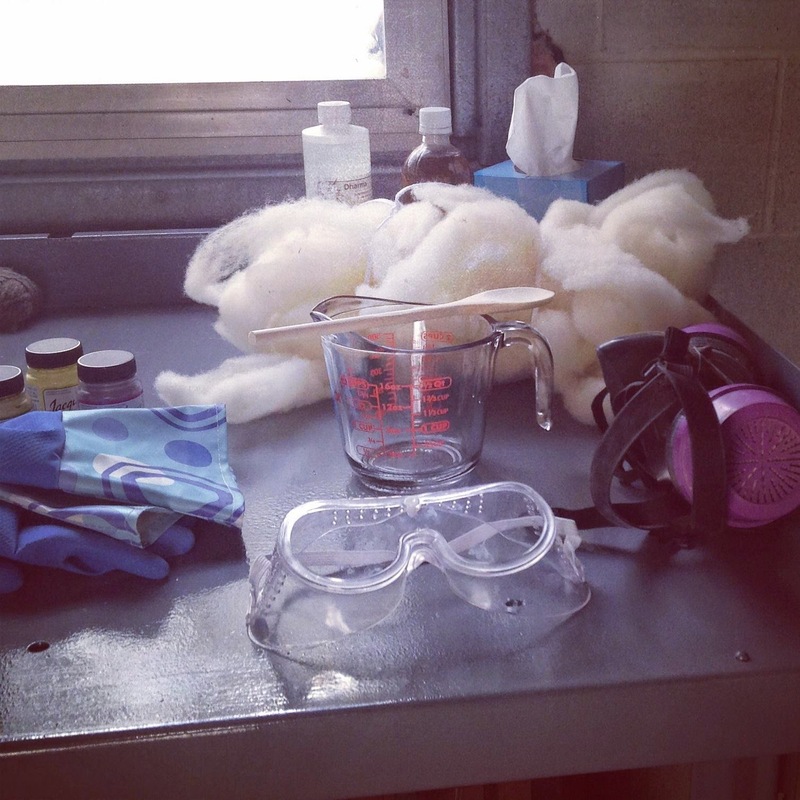 I have dyed wool with Natural Dyes, and Kool-Aid but have not yet tried Acid Dyes. I decided to start with Jacquard Dyes. They have quite a selection of colors and looked easy enough to use. I ordered several colors along with some of the other supplies I would need from Dharma Trading Co. The day finally arrived-I felt organized, collected the supplies on my list, and had read through an entire book on dyeing (more than once) - "Teach Yourself VISUALLY Hand-Dyeing"
I was ready to give it a shot. I didn't take pictures throughout the process. Once I started I tried to stay focused on what I was doing. I stuck with the "simple" dye pot method for the locks and the roving. The Border Leicester locks were dyed the Kelly Green. The results were more of an eye popping Lime Green! My daughter nicknamed it "Grinch Green". It is the same color as a Mountain Dew Pop Bottle lid! Not the results I had in mind. The locks were also not consistent. We decided to take the locks and make roving to blend it together. 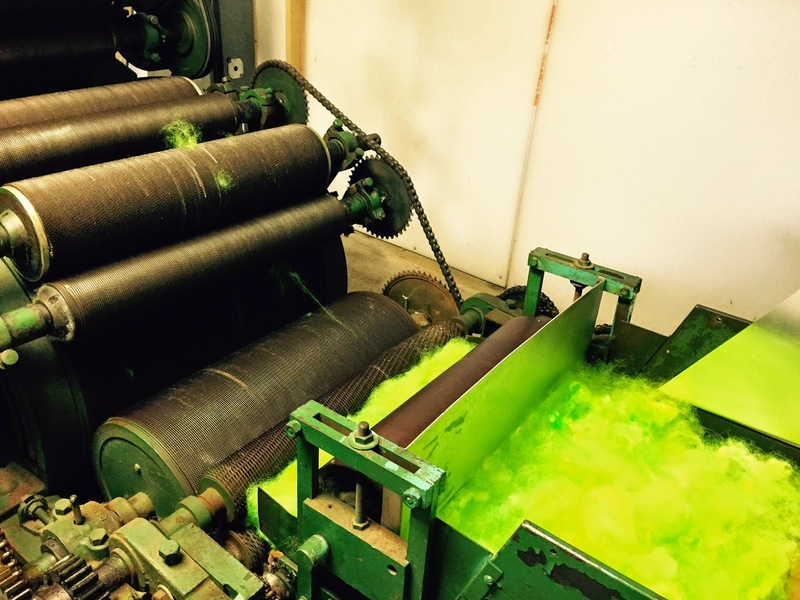 I asked around to some experienced dyers about the green color I got with the Jacquard Kelly Green, several said the results were typical. Advice I received: It could be overdyed, to try to change the color, or I could embrace the color and try to find the perfect project for it. I decided on option #3- put it on the Etsy shop and let someone else use it, someone who could appreciate the color more than I do! The Dye pot did not exhaust (all of the color used up) so I added some Gray Romney roving-I liked the results a little more. The yellow? I used a Cheviot cross wool roving for that. It turned out just like I expected. Yay! Overall, I enjoyed it! I felt like a big kid playing with a chemistry set. I will be trying the Salmon and Turquoise dyes this week. Do not dye a whole pound of wool before checking the color. One recommendation was to test the dye pot with a white coffee filter to check the color/shade before adding the wool. I will definitely be doing that next time. Mike added a really short video of the carder running and making roving for those interested. That sure is a grinchy green, but I think that color is trending now. I am sure you will sell it soon. The first time is always a learning process. Neat video! Is that your very own carder? Color me Grinch Green with envy:) Like you, I like the last two colors better. Learning is so fun. yes, we have a davis and furber picker and carding machine. My husband is a machinist/engineering type guy and bought/set it all up. I once got what I could only call flourescent orange from dyeing with goldenrod. It was horrible! It stayed in my stash for months, but then when dyeing with black walnuts the next year, there was some leftover colour in the pot so I dumped in the orange wool. It came out the best colour of anything I have ever died. It might be worth trying to overdye if it doesn't sell in your shop. Good luck. Thanks Natalie! I will keep that in mind. I dyed with walnuts last year-I loved the rich brown. The Grey Romney is gorgeous..but my eyes are in shock from the green...you could use that as a night light but I bet a child would adore that color for mittens or socks! haha-I think it may glow in the dark! Not what I imagine a Kelly green to look like. Thanks for the smile and giggle this morning with the sunglasses comment! That did turn out pretty bright however, the grey green is quite lovely Sandra! It reminds me of the Martha Stewart color palette. What a neat project. That first green though, yikes! LOL Thanks for sharing on the (mis)Adventures Mondays Blog Hop. I can't wait to see what you share next next time! Thank you for posting this! That eye popping lime green is exactly the color I've been looking for. 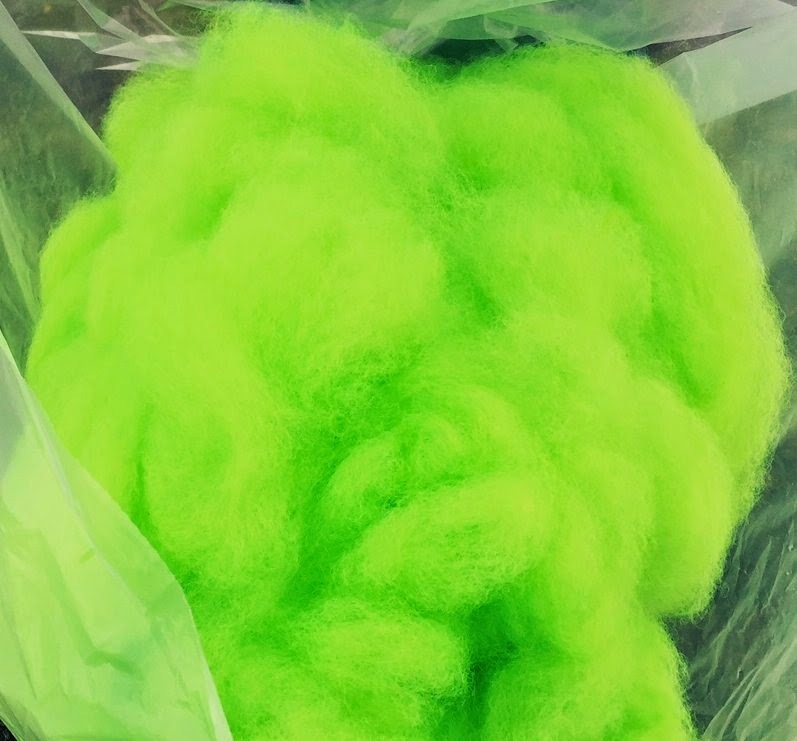 I've spent a fortune on other dyes that claimed to be lime that weren't even close. Then I bought fluorescent green hoping for those results and still no good. I just ordered the Jacquard kelly green and hope I get the results that you did! Any advice or tips on getting that exact color? I never would have thought a kelly green would yield that color and never would have thought to go that route if you didn't post this, so thanks again! I followed the direction on the dye package. I think they should rename the color as it is not a Kelly green color. I used Border Leicester roving which always seems to give the roving some luster. Good luck with your dye project.